The growth of American universities has outstripped private resources and forced them to rely increasingly on public funds, especially federal funds. 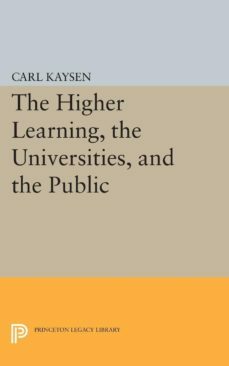 Carl Kaysen asserts that the basis on which the growing public support has been given in recent years does not correspond to what the universities are actually doing, and he surmises that the nature of our governmental processes is such that a discrepancy of this sort cannot long persist. He examines the justification for public support of science and learning and he considers the intellectual and political limits of these justifications. Are they right? To whom do they appeal, and how powerfully?Originally published in 1969.The Princeton Legacy Library uses the latest print-on-demand technology to again make available previously out-of-print books from the distinguished backlist of Princeton University Press. These paperback editions preserve the original texts of these important books while presenting them in durable paperback editions. The goal of the Princeton Legacy Library is to vastly increase access to the rich scholarly heritage found in the thousands of books published by Princeton University Press since its founding in 1905.